Australians have a long tradition of heading away at any chance we get, if it is a public holiday or even just on a free weekend! Gear used to be prohibitively expensive, leading many people to resorting to going away camping with inadequate gear, and in the harsh conditions of Australia this can be a very bad idea. There are 5 pieces of essential gear you cannot live without on your camping escapes that you can get sorted for your families trips away, without breaking the budget, and even accommodating for their more pampered side. Scorching sunshine, pouring rain, and even just the damp from morning dew, can really put a dampener on your trip away with the family. By setting up a 4×4 awning or a gazebo from the Adventure Kings range you will have a fully waterproof shelter that you and your family can retreat to, in even the poorest weather conditions. Able to be set up in just a minute or two single handed, both are rated to UPF50+ which is the highest UV rating given to a shelter and can withstand a massive downpour of rain without even the slightest leak and give much needed cool shade on even the hottest summer day! You can setup your family’s swags underneath, or even an awning tent for maximum protection from the elements at night time. This gives maximum confidence even in the worst summer storms! Shielded by a waterproof and UPF50+ rated shelter your family will be one step closer to relaxing in paradise and can be picked up for under $250 including delivery. Unlike when you are lounging around at home, when you hit camp it is sometimes difficult to find a comfortable place to kick back, sip on a cool drink and watch the world go around. With thousands of options available on the market it is difficult to decide on which camp chair best suits your needs. Look no further! The Adventure Kings Throne camp chair has a gigantic 300kg load rating and a huge 920mm spanning arm rest. The Adventure kings Throne is truly somewhere where you and the family can command your campsite from. Made with 600D polyester, it is made tough enough for even the roughest campers! The Adventure Kings Throne will set you back less than a carton of your favourite drink, and if you grab yours in a combo you can save even more on your campsite! Whether you prefer a cold drop of amber nectar after a hard day of negotiating camp setups with the boss of the campsite, or whether you need to feed a hungry army fresh food for a week, there is only so much a bag of ice in an esky will get you! A 12v portable car fridge opens up a world of opportunities at camp and allows you to chill plenty of icy cold beers really quickly even if you have to save some space for meat and dairy. Adventure Kings has a range of fridges and fridge accessories, and for a fraction of the cost of many of the competitors 12v fridges you can have a reliable refrigeration unit that will run easily off a dual battery system, or even solar! Currently available in 60L and 80L you can choose the model that suits your needs. With stacks of modern conveniences, like light switches and 24/7 power and plumbing, it’s easy to take good bright easy to use lighting for granted. With modern developments in LED lighting systems, you can now have on demand 12v lighting that is brighter than your lights at home and for less than the price of a 6 pack. Adventure Kings Camp LED lighting is BRIGHT, but all models also include an integrated dimmer, on/off switch so you can get the mood just right! With many options you can light up your campsite from as little as the price of a six pack with something like the Illuminator MAX LED strip light or go for a completely custom and versatile whole camp lighting system with the Illuminator 5 Bar Complete LED Camp Lighting Kit for only the price of a case of beer! Modern conveniences make camping easier for the less initiated, and if you pick a campsite close to town you may even get reception to keep the whole family entertained with the latest goss on social media. To make sure that the whole family’s needs are sorted you must have a way for keeping all the devices fully charged for maximum chill outs! A solar charger is great for topping up car batteries when you are at camp, a good solar charger like the Kings 250W panel can be left out all day replenishing the drain on your car’s second battery from the night before. If you needed more umph to charge up your campsite, it might be wise to look into a portable generator, the Adventure Kings range of generators offer maximum power output for minimum fuss and run on the smell of an oily rag. 4 stroke generators are a great tool to have in your arsenal and will find themselves even being whipped out during blackouts, or big family events or where power in a remote area is needed. But most importantly of all, a powered site in peak season could end up costing your family thousands over a few years. A 240 volt generator, like the generators in the Adventure Kings Range will let you setup camp away from expensive caravan park ‘powered sites’ where all you get is a spider infested socket to hook into and some noisy neighbors and a Kings 3.5KVA generator even has enough juice to run a caravan air-con unit. 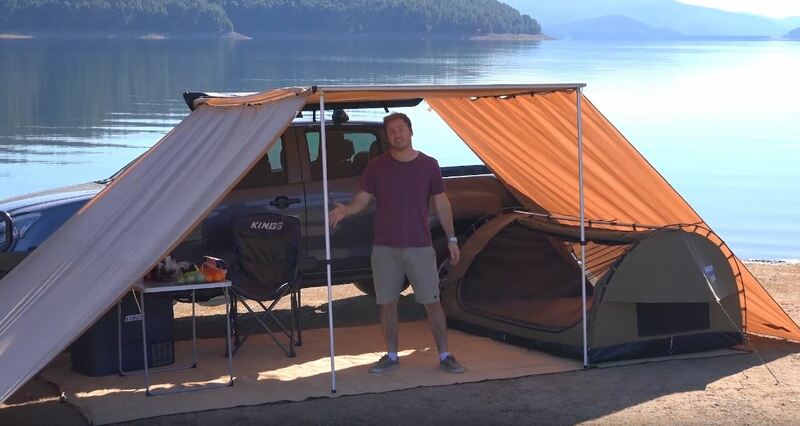 These tips will help you save thousands on your dream campsite and will open up free camping opportunities that you haven’t even thought of yet, so get away with your family and don’t leave luxury at home with your Adventure Kings camping setup!